PROBLEM: Frustrated with Recessed Mixing Areas? 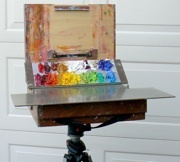 Many plein-air setups fail to provide more than a small recessed area for both laying out and mixing your paints — besides your tube-dispensed colors taking up a fair amount of space, the usability of your total mixing surface is further reduced to its central portion, since paint mixed near the walls and in the corners is hard to clean out. Our easel kits ADD to your PsP’s advantages by “modding” your setup. In addition to holding the PsP (so your colors can be kept clean, in a separate and easily storable “location”), each kit RAISES your mixing surface so you can increase its overall usable area — this simple modification lets you quickly wipe your MIXING surface clean as often as you like (during and at the end of each painting session). otherwise, buy a ready-made directly from us! 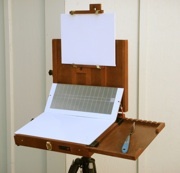 Don’t see your painting setup here? Send photo and/or info and we’ll try to provide the solution! PERFECTLY-SIZED for storing and preserving your paints in the freezer until your next painting session!